This week marked the beginning of the 6th Cooking Matters Course that I have led in my tenure at Food & Friends. That being said, this was still a first for me- the first time I have led a Cooking Matters class for families! Having an audience comprised of 8 through 16 year old children brings on a whole new set of challenges- will some of the children have to stand on crates to reach the table, how will I captivate their attention, and which recipes provide enough hands-on activity for these ever busy fingers? Along with these challenges, however, comes an audience that is sincerely excited to learn, participate and achieve the new trials set before them. Most of the class, adults and children alike, had never tasted an orange bell pepper or fresh yellow squash before! 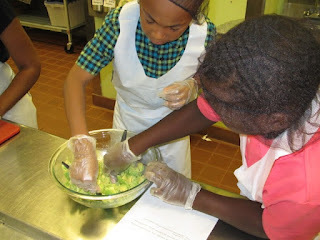 However, after Kennedy (10) and Demaya (9) whisked up a tangy lemon dressing, the whole class was eager to taste the Summer Pasta Salad to which these colorful veggies played a starring role. The kids thoroughly enjoyed crunching up corn flakes to serve as the crispy crust for our baked chicken tenders. As each child took turns breading their own chicken pieces, I couldn’t contain my excitement that the kids were so thrilled to be making these healthier versions of their favorite foods. And they couldn’t contain the excitement over what they had accomplished. “Mom, Mom! This tastes like REAL honey mustard, like you get at the restaurants!” Mom, Patricia, looked just as content that this homemade version is much more nutritious. By the time the second day of the course rolled around, I had learned something crucial as well. 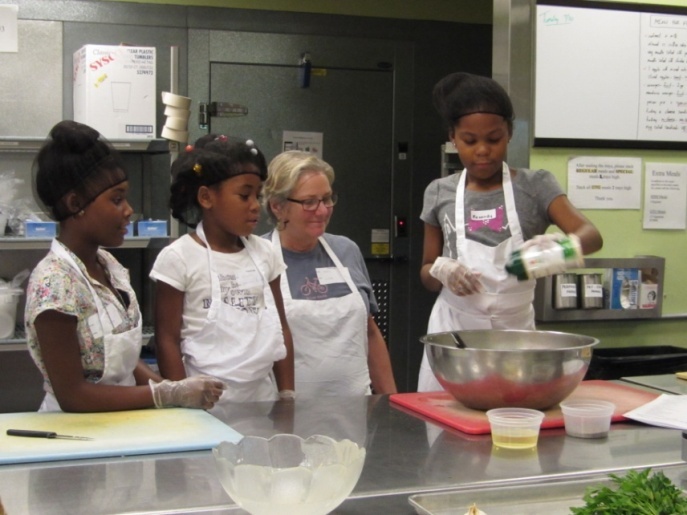 When teaching a cooking class to children, you will be much more successful if they have a task to undertake for every single moment of that class! With that priceless bit of knowledge, we got started. 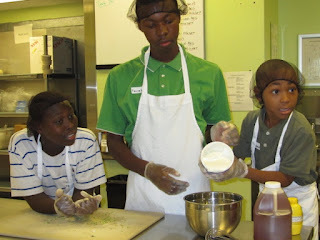 While his brothers, Tyrek and Kendall, were busy mashing avocados, Terrell (16) got to work dicing tomatoes into perfectly uniform pieces to brighten up our guacamole. We were all amazed at this teenager’s patience and determination to show off his ability to safely use a knife in the kitchen. Meanwhile, Patricia sliced juicy summer peaches, and Kennedy mixed together a crumbly topping for our peach cobbler. The class remembered that we use whole oats and whole wheat flour to increase the fiber and nutrition in our dish. A combination of fresh and canned peaches illustrated that fruit is a healthy choice, in all forms. Demaya and Aja (13) helped their Aunt prepare a cool mango salsa to pair perfectly with our homemade baked tortilla chips. Very few members of the class had seen a mango in its whole form before, and were excited to hear this luscious fruit is available in their local grocery stores. Blanquet and Sam were also kept busy, preparing the filling for our high fiber vegetable and black bean quesadillas. The smell of corn, garlic, carrots and zucchini sauteing in the hot pan, tempted the whole group as we finished up final preparations. Blanquet and Sam then guided the children in making their very own individual quesadillas, using whole wheat tortillas of course! I will admit that the prospect of cooking with kids was quite intimidating in the beginning. But, after seeing eyes lit up with awe at the endless possibilities of cooking… I cannot wait to see what new discoveries will be made in the Food & Friends kitchen next week! Morgan Davis one of Food & Friends’ 4 registered dietitians that provide expert advice and counseling to clients facing life-challenging illnesses. Morgan has been with Food & Friends since October 2010.